As is the usual case. Such expense (even minor expense) will be shrugged off until the authorities mandate such equipment. Does anyone know the depth of water in the presumed loss location. If the flight data recorder is lying at that depth and is still in working order what would be the range of its locator beacon. Answering my own question but apparently the approximate depth of water in the vicinity of the objects spotted in satellite images is 10,000 feet and the locator beacon range is about 15 miles. Here's hoping a surface vessel can find the needle in the haystack. I have no doubt to think that if there was a fire in the frwd section, the fuselage integrity was breached pretty fast. Reading MH667 final report it's easy to understand that the hole in the fuselage appeared quite quickly. Don't be confused between the ELT(Emergency locator transmitter) and the underwater acoustic beacon which is attached to the FDR and CVR. I don't believe the ELT will work underwater. The acoustic "pinger" is the gadget on the outside of the right hand side of the FDR. It has a 2 or 3 mile range. Has any debris actually been found yet? Am I right in saying due to rostering, crews only find out who they'll be flying with days before they fly (or even on the day that they fly) - perhaps Deano can give an insight? But if this is the case then you're telling me all the crew were convinced to go along with a hijacking plot within the space of 5-48 hours without a single one reporting anything to the police? Matt I only just saw this but it depends on the airline and what system they use. We use a system called AIMS, which is a worldwide system and you can see who you are flying with within a roster period. The only caveat to that is that this system to see who you're flying with in the "future" can be disabled. Similar with transponders that except for the new style push button transponders it is normal practice after handing off from one airspace and before getting a new transponder code to switch to standby until a new code is inputted. Not the case with all modern transponders. There's usually a standby display that you can input the new squawk code into then you simply move it up to the active position. I've seen on PPrune...and other discussions of the crash by non-aviation people...people asking if the plane could have hit the water and been swallowed whole, leaving no debris. For those of you too young to remember, here's video of a RAF Nimrod hitting Lake Ontario in 1995. Don't view it if you're sensitive. So the short answer is...no, not even a strong modern jetliner can't withstand an impact like that. I don't think anyone can say for certain about the crash mapping of a B777 because it is mainly composite material. Nobody knows how it wold break up in a ditching or high speed entry into water. Dropping the pressure is only a possible technique on freighters. It is not a valid technique when you have passengers and I doubt you'll find it in an airlines fire check list. First and foremost because you'll kill the passengers. I find it hard to believe a captain with 33 years experience would resort to such action. Last edited by Deano; 21st March 2014, 23:05. Sorry Deano, I should have been more precise. I meant: Depressurising at altitude. At FL100 or below, fair enough. As states in your checklist. Above that, you will potentially do more harm than good. In my mind, I was parsing the conversation here and those on other forums were people were suggesting the apparent climb to FL450 was an attempt to snuff out a fire. My head put that and the suggestion above of depressurisation together. I answered imprecisely. My bad. Have a look at the checklist again, it dictates we depressurise then descend to below 10,000ft. Descending is secondary. Flight compartment fire dictates we wind the cabin alt forward outflow valve to fully open. Anyone care to guess why the cabin crew didn't activate one of the manual ELTs in the cabin? While the portable ELTs aren't normally used in such situations, I think it could indicate that the cabin crew either didn't fully understand their situation, or that they were incapacitated. Since it was a 7 hour flight the latter seems more likely. If awake and aware they would have been going through any possible action/scenario. Note: after Air France 447 is was recommended: ...making mandatory the activation of the Emergency Locator Transmitter (ELT) when an emergency situation is detected on board. While this recommendation hasn't yet been followed by legislation, the idea of using an ELT for signaling inflight distress is certainly known in aviation circles. I think this adds further weight to the idea that cabin crew was incapacitated. Chinese satellite images have detected a large object in the ocean that could be part of missing Malaysia Airlines flight MH370, Malaysian authorities have said. Malaysia's transport minister Hishammuddin Hussein said objects were spotted floating in the southern search area in the Indian Ocean. "Chinese ships have been dispatched to the area. Beijing is expected to make an announcement in a few hours," Mr Hussein told reporters at a briefing in Kuala Lumpur. In a later press statement, Malaysia's transport ministry clarified that there was one "suspected" object with an estimated size of 22.5 metres by 13 metres. Attached coordinates suggested it was in roughly the same area of remote ocean as two possible objects spotted on satellite images taken on March 16 and released by the Australian Government on Thursday. Chinese state television later released a copy of the undated, grainy satellite image. China's Xinhua news agency said the object was spotted 120 kilometres from those spotted by Australia. Australian and US spotter planes have been scouring the area for the past three days, but without finding any sign of the suspected wreckage. The development comes after Acting Prime Minister Warren Truss said the Australian-led search in seas off Western Australia's coast would continue "indefinitely". The Australian Maritime Safety Authority (AMSA) is coordinating the hunt in the vast southern search corridor for the jet that went missing two weeks ago with 239 passengers on board. Searching on Friday focused on a 36,000 square kilometre area of wild and remote sea almost 2,500 kilometres south-west of Perth. Three RAAF P3 Orion aircraft, a New Zealand P3 Orion and two long-range commercial jets were involved in the search. Two of the five planes have returned empty-handed. The last of the planes is expected to return to Perth about midnight local time (3:00am AEDT). The search will resume at first light, with extra planes and boats expected to join in. Earlier, AMSA said two merchant ships were in the area together with the Australian naval vessel HMAS Success, which is capable of picking up any wreckage. A total of six merchant ships have participated in the search since a shipping broadcast was issued by the AMSA on Monday evening. Last edited by J Boyle; 22nd March 2014, 19:22. Depressurization is not instantaneous (nobody wants that). Giving time before the descent to the vent system to cope with extracting the air might help in clearing the fumes (pressure differential). Then FL100 for safety. I don't think anyone can say for certain about the crash mapping of a B777 because it is mainly composite material. Nobody knows how it would break up in a ditching or high speed entry into water. The 777 fuselage is an aluminium alloy. It has composite components, such as the radome, wing to body fairing, etc. The tail is also composite I'm told. However, the fuselage is mainly metal. We know how it will react in an accident. The BA and Asiana 777 crashes have shown the fuselage to be quite resilient to punishment. Perhaps you mixed it up with the 787? That does have an all composite fuselage. Last edited by Bmused55; 22nd March 2014, 20:30. 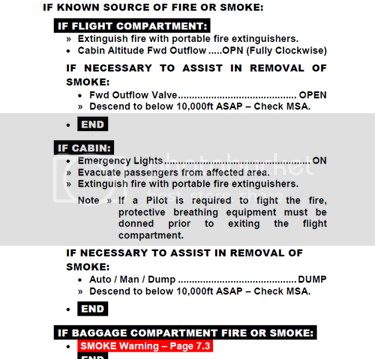 If you look at the checklist again for a flight compartment fire and cabin fire, the first one tells you to open the forward outflow valve. Whilst not akin to a rapid decompression it will depressurise the aircraft within 30 seconds. In the second part in the cabin fire checklist, switching the controller to dump will have exactly the same effect. Initiating the descent is not what the checklist tells you or what it means. However any flight crew worth their salt would have already called a mayday by this point and would be diverting and descending, but it most certainly is not a pre-requisite of the checklist. You're right. I'm talking about the internal structure of the floor beams, pax cabin and the tail plane. The skin is the aluminum alloy you talk about so I'm led to believe. I think the main structure of the aircraft is composite and this is what gives it it's strength that you allude to in the said crashes. rgrt didn't expect that could be so fast given the internal volume of the jet. Last edited by TomcatViP; 23rd March 2014, 05:39. France has now apparently found images of possible debris which they have forwarded to Oz. Presumably France has some satellites floating around?